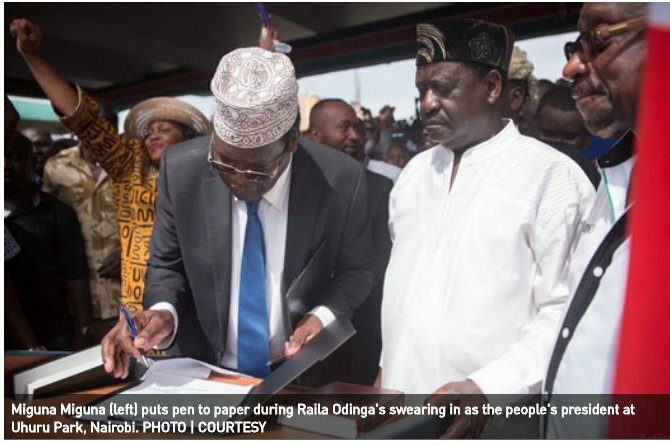 President Uhuru Kenyatta and AU’s infrastructure Envoy Raila Odinga are in peace, but not yet in peace with heart-hurt lawyer Dr Miguna Miguna. The duo on Friday morning had a breakfast at Raila’s lavish Poda farm home in Pondo where they ere hosted by Mama Ida Odinga. They were accompanied by several leaders, among them the vibrant Embakasi Member of parliament Babu Owino, and the alleged Kenyan tycoon Jimmy Wanjigi, who seemed to have landed to the home with a bag of gifts to mama Ida. After the breakfast, they proceeded to Jaramogi Oginga Odinga University where they attended its 6th graduation ceremony. The President was also scheduled to officially open the University’s newly constructed laboratories. The University honored them with honorary doctorate degrees for their historic handshake. Deputy President William Ruto attended a parallel graduation ceremony at Kisii University. All these events happened on the day Justice Chacha Mwita was set to give a ruling on Miguna Miguna’s case regarding his dramatic deportation. The events might have angered the vibrant lawyer, who decided to swear never ever to forgive Uhuru, Raila and Ruto. Miguna who made his declaration via his twitter account claimed that the current government stole two elections and unleashed violence on unarmed, innocent civilians and murdered and maimed thousands unjustly, including children. Then they destroyed his house in Runda, abuducted, detained, tortured and forced him into exile after destroying his passport. Miguna went ahead to state that he can’t by any chance forgive them. They stole 2 elections and unleashed violence on unarmed, innocent civilians and murdered and maimed thousands unjustly, including children. Then they destroyed my house, abuducted, detained, tortured and forced me into exile after destroying my passport. I can’t forgive them. Dr Miguna Miguna, if you are to be part of Jesus Christ followers: then you should forgive these vampires kids of the devil Lucifer. Once you forgive them, it will become the beginning of their downfall to abyss cos hell can’t accommodate them. God will deal with them once you forgive them. Many Christians miss heaven due not willing to forgive: If you forgive God will also forgive you and start acting on these useless vampires.